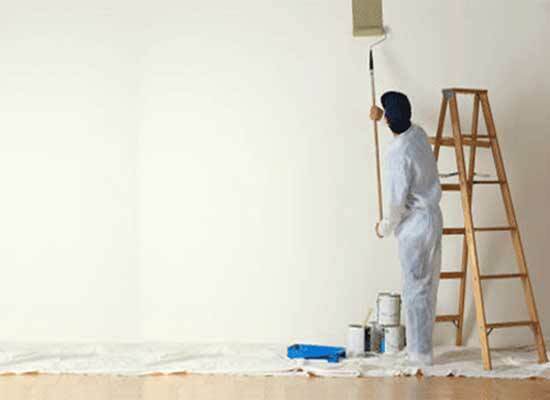 Whether you are painting the walls, ceilings or the trim, all areas not to be painted will be covered and protected. We move all furniture as needed. All switch plates are removed. We vacuum all areas behind the furniture. All areas will be sanded (if possible, textured ceilings and walls will not be sanded). All small and large defects, holes and any other areas patched. All windows, moldings, trim etc. will be caulked as needed. All areas will be primed as needed. Two coats of a high quality paint will be applied. The sheen level will be determined by the owner, typically walls are a flat or eggshell finish, ceilings are flat finish, trim and wood work is usually a semi gloss or satin finish. All areas are left clean and all furniture moved back. We ask that all landscaping be trimmed at least 8” away from the areas that are to be painted. All areas are pressure cleaned. All mildew and algae areas are treated with a chlorine solution (roofs are pressure cleaned only) depending on the size of driveways patios and sidewalks these areas are usually cleaned as well at no additional charge (this will be determined at the time of the estimate). All windows, lights, plants, trees etc. are covered. All vertical surfaces and roof areas have a masonry conditioner applied. All windows, utility boxes, hose bibs, etc. are caulked. All cracks are repaired. A high quality 100% acrylic paint is applied (flat, low luster or semi gloss finish). We recommend a low luster finish for the house and trim and a semi gloss for the doors.